Cellist Alisa Weilerstein has been sharing her art with Cincinnati this week – at Children’s Hospital, the College-Conservatory of Music and in residence with the Cincinnati Symphony Orchestra. 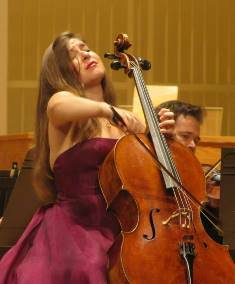 She crowned that residency with a brilliant performance of Haydn’s Cello Concerto No. 1 in C Major Friday night at Music Hall. Providing an ideal accompaniment was guest conductor Asher Fisch, who also led the CSO in a probing exploration of music by Richard Strauss and Wagner. Weilerstein is a sensitive and demonstrative performer, with facial expressions and body language to match her playing. This was never taken to excess, however, and together, they brought Haydn’s spirited concerto to life. Her rendition of the first movement was precise and supremely elegant, with nimble negotiation of the highest positions on the cello. The second movement was very affecting, Fisch (in his CSO debut) calibrating his accompaniment to match Weilerstein closely throughout. Sparks flew in the finale, which was taken at maximum speed. Weilerstein etched her first statement beautifully, and she handled the movement’s supremely difficult technical demands with aplomb. Her only limitation was Music Hall itself, whose size and expanse kept her from being heard clearly in some of the Concerto’s softer moments. Despite an enthusiastic ovation from the crowd, there was no encore. Fisch, world-renowned as an opera conductor, particularly of the late romantic German repertoire, was in his element with Strauss and Wagner. And there was a lot of Strauss, the suites from his operas “Der Rosenkavalier” and “Die Frau ohne Schatten” (“The Woman without a Shadow”). The latter, a CSO premiere, was heard first after intermission. It is hyper-romantic, not to say turgid music, drawn from his complex opera about an empress unable to bear children (the meaning of the shadow) who bargains with a humble dyer’s wife to buy hers, then changes her mind in remorse and is rewarded at the end with her own shadow. Scored for a huge orchestra, it featured principal trombonist Cristian Ganicenco in gleaming solos expressing the dyer’s love for his wife. “Rosenkavalier,” by contrast is a comedy about a clumsy baron and his overtures to a younger woman. Famous for its waltzes and the magical music of the silver rose, it and “Frau ohne Schatten” were a showcase for the CSO and were led with distinction and command by Fisch. Concertmaster Timothy Lees was a standout with his agile solos in “Rosenkavalier,” a color-drenched score that made one smile from the cavalier’s entrance to his exit on three emphatic chords. The CSO expressed their appreciation for Fisch by awarding him a solo bow, i.e. refusing to stand and letting him bask in the applause at the end. The concert opened with the Prelude to Wagner’s “Parsifal” in a reading that was a bit slow to get off the ground, but soared with feeling in its climactic moments.